7 Comments Published by Terrace Crawford on 4/28/10 at 1:50 PM. Like my friend, Tony, the gift of speaking in tongues was at the bottom of my list. So whats your top 5? 0 Comments Published by Terrace Crawford on 4/27/10 at 7:29 AM. 2 Comments Published by Terrace Crawford on 4/26/10 at 3:22 PM. Had an incredible two-day discipleship event for students this weekend. It was really moving... and I'm seeing some great things happening with our students. In some of our sessions this weekend we played a number of the Minute to Win it games. Everyone had a blast. We brought in a local band that did a wonderful job connecting with our students. I highly recommend them to you. At one of their upcoming shows they will be opening for Leeland, one of my favorite artists in Christian music. #Facebook Fact: Sometimes I regret commenting on someone's post because I get all the subsequent notifications and emails to follow. It feels like its been forever since last Monday but the week seemed to fly by. Weird. Watched this video today entitled "Miracle at Joshua Tree". Incredible story. I've been enjoying the guest posts on the weekends here. Hope you have too. This was my favorite text msg of the weekend. The newspaper industry is in crisis. I have been offered more free papers and have found more free newspapers on my doorstep than ever before lately. Played a game (that I've never played before) called "Things" with some of our students this weekend. It was lots of fun. I've registered twice this week to win an iPad. Truth is, if I were to win it I'd probably give it away to YOU. I don't really desire to have one. My friend, Brad Cooper, wanted to rub it in that he was at Outback tonight. Keep watching the blog this week for a FREE giveaway. Can't wait! Speaking of FREE... click [here] for some free curriculum. 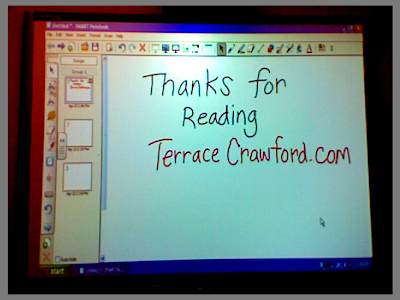 1 Comments Published by Terrace Crawford on at 2:38 PM. 3 Comments Published by Terrace Crawford on 4/24/10 at 4:39 AM. Mark Cox blogs at ThinkNextNow.com. Mark and I met on twitter back in the day. (This is one of the reasons I love twitter - networking!) He has been in full-time youth ministry since 2005, but his heart for reaching the next generation came long before that. Read this post and then watch his blog for part two on this same topic. I think you'll really enjoy connecting with this guy. One of the most counter-intuitive portions of youth ministry is an intentional pursuit of a good relationship with your senior pastor. That's not to say youth pastors don't want one - we just generally don't start off knowing how to sustain one. When I started in youth ministry, my idea of a relationship with my senior pastor was working hard without any communication. That's probably why I had such a hard time. I was fortunate enough to get a second chance at the church we've been at for the last three years, and I've learned a couple of big lessons along the way that might help you before you make the mistakes that I (and many others) have made in the past. What are his values? If you value modernity, and your senior pastor values old school traditions, you're going to have a breakdown. If you don't value the same things, you can probably expect to disagree on a lot of foundational issues. Disagreement can be expected on a couple of issues, but if you disagree about your root beliefs in ministry, it's going to be very difficult to sustain a great relationship with your pastor. Do you talk negatively about your senior pastor around others? This is a tough one for a lot of us, because our hearts are involved in our work. Ministry isn’t just a paycheck. Our lives are steeped in our work. So when the leader makes a big mistake, it’s easy to want to vent to everyone who has an open ear. But watch yourself: are you giving the people around you a reason to stop following your senior pastor? This is a simple business rule. Talking negatively to those under your leadership about your leader is gossip. That’s never the solution! Guard against that! What questions does he repeatedly ask you? Andy Stanley once said that the questions a leader repeatedly asks usually drive the organization one way or the other. The point he makes is that when a leader, or boss to emphasize the point, asks the same set of questions over and over, you can see what is important to him or her. If you start paying attention to your senior pastor is asking you, it might give you some insight into what they want to see from you. Are you committed to him as you want him to be to you? A couple years ago, my senior pastor went through a pretty major challenge in ministry. I knew that he was fighting some tough issues. I walked in his office one day without any agenda or purpose, other than to tell that man that I believed in him and that I had his back. He looked at me as if I was the only person who’d ever said that to him. That was a moment that marked my relationship with him. Since then, we’ve walked through the trenches together in ministry as friends. It was simply the most powerful moment that he and I ever experienced together. If you were a senior pastor, would you hire you? Really? This is the question that should keep you up at night. Are you worth hiring? Youth pastors get a bad wrap for being lazy, uninspired, and having poor work ethics. So, this is the question I repeatedly ask myself: Would I hire me? If I were the senior pastor, would I want someone to come in late to work every day? Would I want someone who gossips about me? Would I want someone who ignores my leadership? Maybe the best thing you can do for yourself today is to do some honest self-exploration. Ask God to do some surgery on your heart. If you’re like me, you could always use a little more intentionality in your relationship with your senior pastor. Choose today to show him that you have his back. What do you have to lose? What do you have to gain? 7 Comments Published by Terrace Crawford on 4/22/10 at 11:57 AM. Got to play with a new SMART board today. This interactive whiteboard is really cool and cost way to much for a guy who doesn't have a budget to work with... but I had fun writing this important message to you with my fingertips. 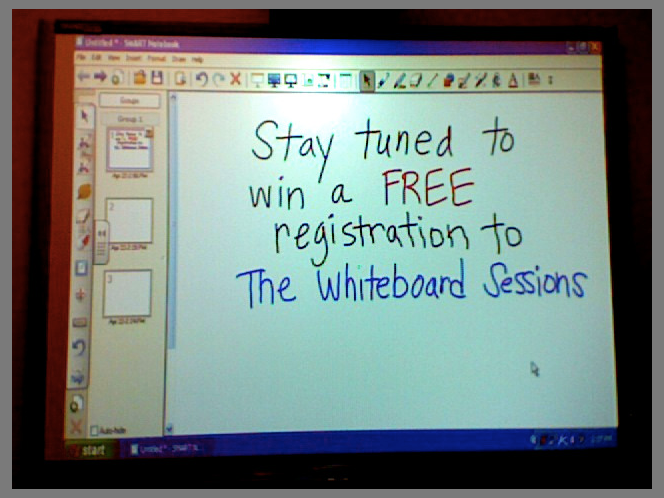 Learn more about The Whiteboard Sessions coming to Va Beach [here]. 3 Comments Published by Terrace Crawford on 4/19/10 at 8:41 PM. My neighborhood had a community garage sale on Saturday. I decided to join in and had a blast. It was a really cool chance to meet the neighbors. Two of my students were on their senior trip this week and are now stuck in Paris because the flights have been grounded. I got my Mac Book back on Friday. Took Apple just 2 days to fix it. Now, THAT is what I'm talking about. Say what you want to... but Apple is the bomb-diggity. My mom had a birthday on Friday. I love you mom! This weekend was bittersweet because it was our Worship Pastor's last Sunday with us at church. I am going to miss Russ Monroe leading us in worship. We had a great send-off reception for him. The testimonies about how God has used his life were awesome to hear. Just got off the phone with a rep of a company. One of the worst customer service experiences I've ever had. I'll NEVER understand why companies put their worst people on the phones as first contact with the public. That is stupid. I killed a black widow earlier today... and live to tell about it. Although, I told a friend about it and they said "Why did you kill it?!" Me: "Um... because they kill people." Had a great talk with one of my mentors and former professors today. I love when we get to connect. Saw this guy today that looked identical to an old friend who is no longer living. It shook me for a few minutes because it was literally like seeing a ghost. That ever happen to you? I have got to fill that Census form out... ugh. Some people try to get ahead by stepping on others. I hope I never adopt that philosophy. I'm going to enjoy a hot minute of solitude... before the evening passes me by. 1 Comments Published by Terrace Crawford on 4/17/10 at 3:57 AM. Jason Curlee blogs at JasonCurlee.com. 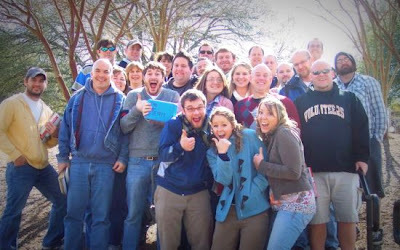 With over 14 years working in student ministry and now as a Campus Pastor for Bay Area Fellowship in Corpus Christi, Texas, his blogs are about creating content that ministry leaders can find practical and inspirational as well as sharing the ministry principles and experiences accumulated since 1995. Jason says, "It’s about being innovative, unique, and creating content that influences and develops others to make a difference in their world." I have a little secret. Well, it's not much of a secret, but I don't want the people I led for the first 4 years as a student pastor to know that I spent a lot of time winging it. I would read and pray during the week but would have no idea what I was speaking on that night. One time I even flipped through the Bible while I was talking about the offering looking for a Scripture to speak on for my message. I had several adults that showed up to help but they really were just baby sitters since I ran around doing pretty much everything last minute. They showed up and interacted with teams but really didn't do much cause I didn't have anything for them to do. Since we really didn't plan out most of the music was all practiced about an hour and a half before start time...and it showed most of the time. It was ok but it wasn't great. The ministry we had was decent for any student ministry in our area but it really wasn't great and our attendance was like a roller coaster. And the kicker was one day I looked up during one of our 45 minute worship sessions and realized that we were no longer reaching the students where they were...we were doing ministry how we liked it. Are you winging it? Does your ministry sound a little like this? 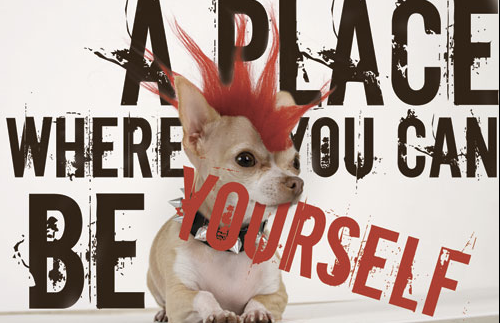 Then STOP & make a CHANGE!!! The students you lead deserve more than a wing and an prayer. The students in your community who don't know Christ have a possible eternity more precious than you just showing up and going through the motions. The future generation of church leaders sitting in your seats deserve a model that shows them how a impacting ministry should run. Plan out your messages and show up with a message you have already prepared. 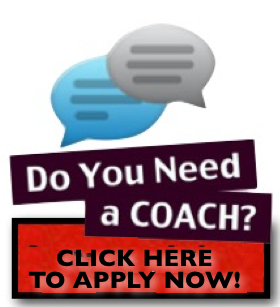 Begin using your adult volunteers as a team of highly specialized youth workers. Develop some leadership positions and have them start leading teens to do the work of the ministry. Plan ahead and you will see that you will be able to put more creativity into what you producing and will also begin to utilize it to reach more teens. What area do you need to stop winging it in? 0 Comments Published by Terrace Crawford on 4/16/10 at 11:48 PM. I’m convinced I have the best team of sponsors (and there's room for more!). These are the people who literally keep it moving & shaking around here. I gave away over $16,000 in free resources on my site last year, and I owe much of that to sponsors like the ones that follow. This year I'm going to nearly triple that figure! 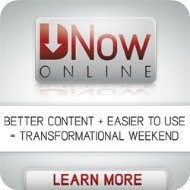 Do me a favor and click through to one or two of these sites. If you find something you like, tell them I sent you. 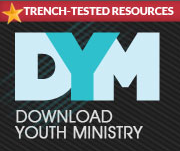 Simply Youth Ministry - premier resource organization for today's youth worker. These guys are incredible to work with! [Tell Andy I said hello]. Clover – provides websites for growing churches and ministries that are slick, user friendly and very affordable. If you are in need of a website, you simply must check them out! Simply TXT - provides mass texting to companies, orgs and yes, ministries like yours. This is the TXT service I use and I love it. [Contact Matt and get your service started today]. The Whiteboard Sessions – Seven, influential speakers will have 30 minutes each to present one, compelling idea at this one-day conference on May 21 in Va Beach, VA. There's still room for you! 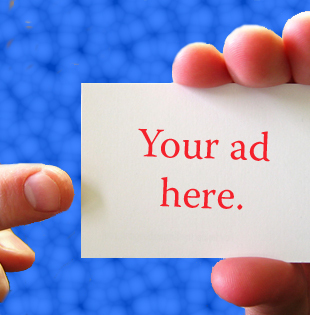 If you’re interested, I have one advertising spot available for your organization. Email me for more details. I’d love to have you join our team! 5 Comments Published by Terrace Crawford on 4/14/10 at 7:05 AM. 2 Comments Published by Terrace Crawford on 4/13/10 at 1:10 PM. I look forward to connecting with each of you. Did I not mention you? Leave me your name and blog URL and I'll add you to the list! 1 Comments Published by Terrace Crawford on 4/12/10 at 7:52 PM. The weather was beautiful today. I'm talking perfect temp folks. I'm putting in my request for the next few weeks...and by a few weeks I mean all year! #FacebookFact: I started this fan page because songs I love go on repeat! We announced on Sunday that our Worship Pastor resigned and is taking a position in TN. I told him he was moving outside of God's will. =) I will miss this guy. Saw the movie "How to Train a Dragon" earlier today. Great movie. Got a DM from my friend Sherri Shepherd today. Haven't spoken to her much since she landed on The View. Glad she's representin on twitter these days. Wooooah! Leg cramp. Yikkkes that hurt. Shoutout to Kate Queen and Chelsea Cameron, who both read the Manic Monday Minute! Enjoyed some Chipotle with this dude earlier today. Always great to hang with him. To say I'm excited about this is a gross understatement! I thought CoCo's tweet today was ha-larious! Thinking of creating a Life on Life t-shirt. Thoughts? I have to remember to buy light bulbs. I seem to always forget that when I'm at the store. I feel crippled without my macbook. This stinks. Adam Lambert is the mentor this week on American Idol? I'm getting lots of emails asking if I'm still accepting guest posts. The answer is "yes." 4 Comments Published by Terrace Crawford on 4/10/10 at 7:44 AM. Chad Swanzy is one of my favorite bloggers and the FIRST PERSON EVER to guest post on my site! You can check out his blog [here]. He's got a creative head on his shoulders and his heart beats for many of the same things mine does... including resourcing other leaders, which he does through a new site he launched [here]. A different style of preparing for a talk. It’s tempting to think that doing a talk for students would be like a game of golf. If you’re lining up in the same stand, swinging at it with the same technique, and paying attention to the mechanics that at some point it would get easier… right? It doesn’t. Like golf it can get very frustrating and bring a lot of pain instead of being a joy to participate in. The method below has helped a lot of people process through the mental clutter and frustration that we all feel when we want to be heard and have conviction about a topic we will bring in front of students. When you prepare for a talk you’re going to focus on two questions. The second part of the talk is where usually everyone has the potential to screw things up. You’ve work hard in the beginning to gain their attention, create desire toward a preferred end, and then you’ve got this awesome transition that brings with it a lot of temptation for you as a speaker. Here are the big pitfalls. 1. Do not think that you have to tell them every single thing you how about how to solve the problem. Give them one simple step first then describe the following step for when they are ready. Do not give them 7 steps in a cunning crafty acronym. It’s too much to absorb and if they feel they can’t even get past step two they will dismiss the solution all together. 2. Do not think that you have to get their attention just one more time. You’ve got them already in the palm of your hand. You’ve told a funny story or showed a clip to gain their attention, clearly defined a desired position, and proven that it’s a place they need to go to. Step right into the second question and answer it. You’re going to distract them with one more joke or one more story to reinforce the same thing you just got through saying. Once you’ve moved them in an inspiring way by creating buy in toward the issue and given them one simple step, end it. Close and walk away. Don’t linger on convincing, compelling, or bantering on about what to do next. If your talk was twenty minutes 12-15 minutes would belong to the first question and 8-10 minutes would belong to the last question. Confession: I'm a Bit of Drinker. 2 Comments Published by Terrace Crawford on 4/9/10 at 9:47 AM. I'm a bit of a drinker. I can't seem to break the addiction of sodas. (No, not alcohol silly!) My favorite soda of choice is Coca-Cola. It's like a deep-burn going down... which I'm sure does a body good. ... but I look at my delicious soda and say "I can't quit you!" I was a little sad to see it contained Aspartame. It was like a beautiful letdown because I've heard all the negative hype over it. I've even started researching the sweetner online and have read the 92 dangerous adverse reactions it could have on your body. I'm not convinced it's that bad... but I'm willing to drink it until my doctor says that I should stop. At least for now it has caused a MAJOR decrease in my soda intake. So, here's to a leaner, trimmer bod! By the way, I've made a few other changes to my diet and lifestyle that I'm really digging right now. I'll share those in future posts. Any new finds that you might recommend to me? 3 Comments Published by Terrace Crawford on 4/8/10 at 5:56 PM. 2 Comments Published by Terrace Crawford on 4/7/10 at 8:44 AM. The news department at CIU picked up my latest blog post and did a brief news story that was published early this morning. 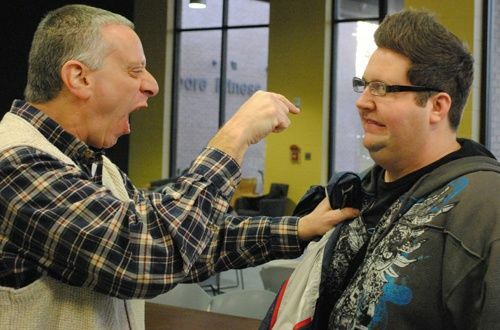 They added this funny pic with a caption that reads "Dr. Olshine counsels Terrace Crawford." Read the news story [here]. 4 Comments Published by Terrace Crawford on 4/6/10 at 12:45 PM. The university I graduated from gave me numerous reasons to love her while I was there studying, but now that I am an alum of the school I often wonder why they really want to invest in me now? It's because they care. I'll never forget getting a call from one of my professors in the fall of 2008 (yes, a phone call!) telling me about a retreat-weekend they were putting together for alumni of the youth ministry program. I was floored! "Wait a minute... you are putting together an all expenses paid retreat for alumni?" I asked. 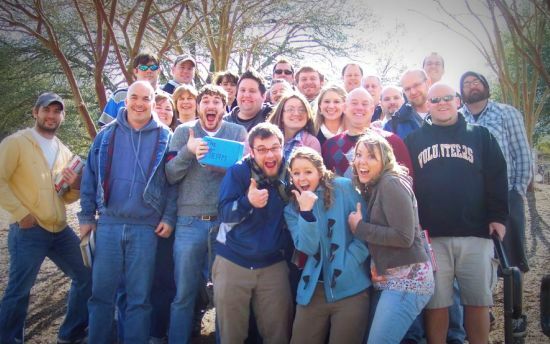 Months later (Spring of 2009) I was standing on the campus surrounded by fellow alumni of the program. We enjoyed seeking God and sharing life together that weekend, which was priceless in itself, but I would have driven those 8 or 9 hours just to spend time with my professors -- my mentors -- because they poured themselves so deeply into my life while I was a student of theirs, and I was eternally grateful they wanted to continue that relationship even after I had graduated from their program. The next fall the same thing happened all over again. The phone call - the weekend - the spiritual renewal I so much needed. And their doing it again. I recently told the chancellor of Columbia International University that I'd be willing to pay my tuition all over again for what I've received at CIU. It's home to me... and there's no place like home. 1 Comments Published by Terrace Crawford on 4/5/10 at 8:02 PM. Boy, it was a hot one today. Got sunburnt this weekend. Oh yes I did. #FacebookFact: My relationship status on Facebook has been set at "single" since day one... until April Fool's day. I changed it to "in a relationship"... and then my page blew up. My phone also blew up. People went nuts! Lots of guests in our services yesterday. Great to see all of our worship services were packed! Did something different this year for students at our church. We hid easter eggs all over our city and had a bit of a scavenger hunt. They had a blast! We had one little prob during the event. Someone in our church apparently ordered a stack of pizzas for their personal party and they showed up to our gathering. You can imagine the beautiful letdown when students found out they weren't getting pizza. Crosswalk was incredible this year. Hands down its one of the coolest things I think our church has ever put together. Can't wait till next year. Just saw The Lion King (broadway show) is returning to our city this year. I'm stoked. I've seen it before and its totally worth the ticket. Spent the day at the hospital while one of our students had heart surgery. Best way I knew how to pass the time in the waiting room. Heard today that the trend this summer will be wearing socks with sandals\flops. Eww. Just wrote up two (count 'em - 1,2) guest blog posts for other sites. Just gave Holiday Inn a really bad review from my latest stay at one of their hotels. I'll think long and hard before staying with them again. I've been really blessed to make some incredible connections in ministry. Missed a call from one of my heroes earlier today. Bummer. 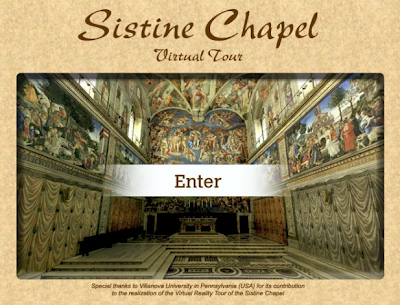 Spent some time with these folks (virtually) today. Great people, great service! Remember the virtual mix tapes? I loved the idea so much but it got dropped like it was hot, no? Didn't know this guy but was saddened to hear of his passing today. Is it bizarre that I think I'm going to have a personal meeting with Billy Graham in the near future? Lord, you can make that happen. Drop me a comment in this post if you're attending Whiteboard. I'm compiling a list of bloggers like I did for 2007's event and I want YOUR name on it. 4 Comments Published by Terrace Crawford on 4/2/10 at 9:28 AM. I've written a number of guests posts for friends over the years but I've never really entertained the idea of having guests posts on my blog. If there is two quick things you need to know about me, its this: I love networking and I love resourcing other leaders. I figure I can scratch both itches by having YOU write a blog post for me. The way I see it, I'll get to share YOU with my readers and your offerings might be a great resource to leaders everywhere. It's a win win. Email me a guest post if you'd like to participate, and I'll sort through and choose posts to feature here on my site. 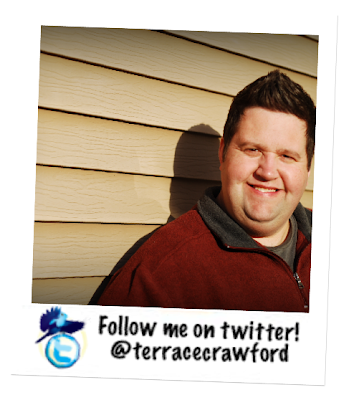 If your post is chosen, I'll contact you personally and let you know when I'll be posting your content here at TerraceCrawford.com. Since I don't blog much on the weekends, I'd like for you to take the stage then. Readers, look for the very first guest post as early as next week! 4 Comments Published by Terrace Crawford on 4/1/10 at 7:40 AM. 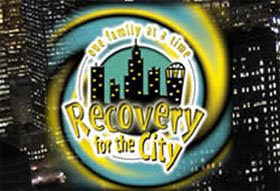 This is 1 of 3 little numbers (postcards) we're sending out to the 757 to market our church. This particular piece is focused on students. The header on the back side of the card says "Crossroads: Where Mullets and Mohawks Are Welcome" (... er in my case, Faux Hawks). We worked with our friends at Outreach to design these. Check out their services and tell them I sent you.